The first time my team completed Destiny's Vault of Glass raid, it took us more than 10 hours. The second time, it took us 90 minutes. The time difference between our first and second attempts reveals something crucial about what makes the Vault of Glass special. Its difficulty lies not in how it demands dexterity, skill, or careful shooting, though those things certainly matter. Rather, the Vault of Glass is challenging because it's a mystery. It never tells you what to do, and can only be mastered through repeated trial and error. Your team learns and communicates, gradually coming up with successful strategies. Once you've learned what to do and how to do it together, it all becomes fairly easy. The Vault of Glass is what's known in MMO circles as a "raid," a standalone dungeon designed for a group of high-level Destiny players to tackle as a team. 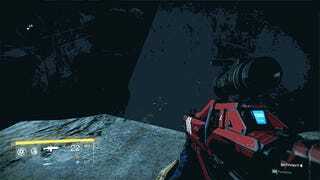 For the first week that Destiny was on store shelves, the Vault wasn't even available—it was added to the game as free downloadable content a week after everyone started playing. The raid's requirements are steep: All players are suggested to be at least level 26, which means navigating the game's time-intensive post-level cap existence. There's no automatic matchmaking, meaning that each player will have to coordinate with a team of six friends, all of whom need microphones for voice chat. It took me the better part of two weeks to get to where I could play the first part of the raid for my review of the game, and it wasn't until another couple of weeks later that I finally completed it. The raid is a terrific piece of game design on its own, and becomes all the more interesting when placed against the game it accompanies. Where most of Destiny is repetitive and mechanical, the Vault of Glass is ever-changing and mysterious. 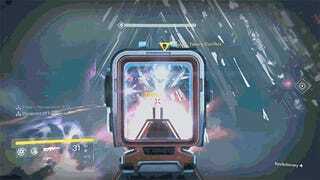 Where Destiny missions all boil down to the same objective, copy-pasted over different environments, the Vault of Glass forces players to constantly adapt and learn new strategies. The Vault of Glass is an 8-course gourmet dessert following Destiny's bottomless bucket of fried chicken. The contrast is welcome, if jarring. 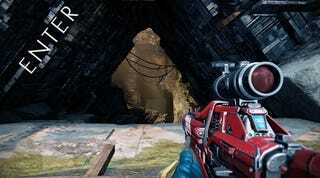 There's the front door, which can only be opened if the team coordinates to occupy three pressure plates spread around a cliffside, all while fighting off an onslaught of difficult high-level enemies. There's the Templar battle, a five-stage boss fight that eventually has players calling out glowing "oracles" that can mark the whole team for instant death, all while one player picks up a shield relic, charges it, and uses it to fire a blast that temporarily brings down the boss's shield so the rest of the team can launch a coordinated attack. There's The Gorgons' Labyrinth, an area that (hilariously) introduces stealth to Destiny, forcing players to carefully make their way through a series of caves guarded by nigh-unkillable beasts that almost immediately wipe out your team if they spot you. There's a massive jumping puzzle featuring hundred-foot drops and vanishing platforms. 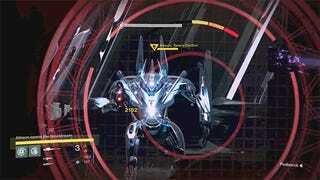 And there's the final encounter in the Vault of Glass itself, during which you must leap through time-gates into the future and the past before taking on Atheon, a huge Decepticon robot with a gun the size of a rhinoceros who periodically teleports half of your team forward or backward in time, and whose defeat necessitates the use of a pair of relic shields, the defeat of dozens of deadly oracles, and the coordinated opening and shutting of two time-gates in a strategy so elaborate that it'd require another 500 words to document. Pause and consider all that. If you've played Destiny but haven't played the raid, the above list must sound like a completely different game to you. That's because in a lot of ways, it is. "The raid really is about a couple of things at the core," Bungie's Luke Smith told me over the phone last week. "It's about a sense of discovery, whether it's discovering a new environment or discovering how to tackle the problems that you're about to encounter with your teammates. And when you think about what you want to explain, if you want the player on a journey of discovery, well, we didn't want to explain much to them at all. Part of the fun, in fact most of the fun, is figuring it out on your own." "Part of the fun, in fact most of the fun, is figuring it out on your own." Smith, a games-journalist-turned-game-developer who, as it turns out, worked a stint for Kotaku years before I had even heard of the site, was the lead designer on the Vault of Glass. I'd reached out to him late last week to try to get a better sense of how Bungie made this weird thing, and what it might tell us about the future of Destiny. It was a cool conversation; I've posted a transcript of our full Q&A over at our TMI blog. Smith led a team of four designers who worked separately from the rest of Bungie's core Destiny group. "We worked in a pretty isolated and cool way where we were able to explore a bunch of ideas," Smith said. "We had an entirely different set of constraints from some of the other teams. The pillars of raids were things like 'cooperation required,' 'voice required.' We wanted to make assumptions in development that players were going to be able to communicate with one another, which informs and liberates us to explore a bunch of different ideas." I asked Smith how he felt about the fact that so many people who play Destiny may never see the inside of the Vault of Glass. "It's something that I'm of two minds about," he said. "One, we want as many players as possible to get in and have that experience. And two, while it sort of flies in the face of one, we also want an aspirational endgame activity that players look at and go, 'Gosh, I hope I can go in there someday. Gosh, I watched this video and it was bizarre, and I want to go to that place.'" Smith said that they spent a great deal of time playtesting the raid, and that it was a challenge to find a "normal difficulty. He described that as something that six dedicated players could take on, feel challenged, yet still have fun. "It's easy to make something very hard," he said. "It's hard to make something that players are going to learn, fail at, and have a great time playing." 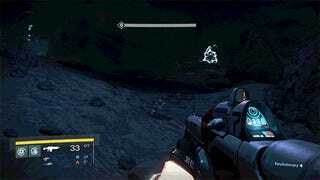 Here's an example of the kind of learning process that happens in the Vault of Glass. We've fought our way through the majority of the raid and arrived at what appears to be the final area. We're guessing that because it's called "The Vault of Glass," which seems about right. The Vault itself contains a large center area flanked by two time portals, which we had to open in order to get to this point. They're closed now, but we know they go to two separate "versions" of this room—a verdant area set in the past, and a dusty, brown area set in the future. The gates are closed now, but we're eyeing them with trepidation. Surely they'll factor into this somehow. The final boss, Atheon, stomps into center stage and immediately begins firing at us with his huge gun. We scatter and begin to dodge and shoot at him, impressed with how our weapons seem to have basically zero effect on his massive health bar. This carries on for couple of seconds before he raises his hand in the air, and… suddenly I'm teleported to another place. Chaos. What just happened? We're all shouting into our mics. "I just got teleported!" "Where are we?" We begin trying to communicate, when we hear a telltale chime: Somewhere, there's a oracle. If we don't shoot it quickly, we'll all die. We're all panicked, looking for the oracle, and my screen begins to go black. "I can't see, I'm going blind!" I cry into my mic. No one is shooting the oracle. I can still hear it. My screen goes black. Seconds later, our entire team is wiped out. Reset. Atheon walks into the room and begins firing. We scatter and begin to shoot at him. As we do that, we're already trying to pick apart what just happened. Some of us teleported, but others didn't. 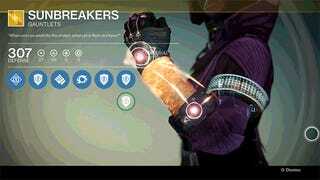 Atheon raises his hand again, and I teleport once more. There's a relic shield here, and I pick it up. I'm still going blind. I hear an oracle. My teammates spot one, just above our position where we were teleported. They begin shooting, but it's too late—we hear another oracle, and another one. Soon we all die, and so does the rest of the team. Reset. 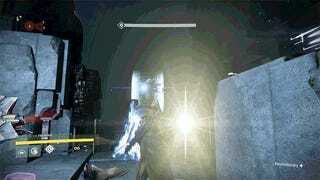 Atheon walks into the room and begins firing. We let this play out a couple more times, and begin to figure out what's happening. About 30 seconds into the fight, Atheon is teleporting three of us directly into either the past or future-versions of this room. Once there, we must pick up the shield relic and fight our way back to the portal. 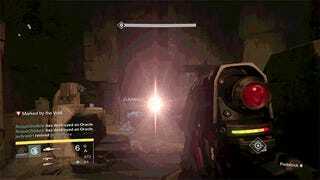 The three people who remain in the room with Atheon must go and activate the portal so that we can safely return with the relic shield in hand. The twists continue: Everyone who is sent to the future or the past quickly starts going blind, so whoever is holding the shield is required to "cleanse" them periodically. Shortly after arriving in the future or the past, deadly oracles begin to materialize in the air above the other, no-less-deadly robots. One player must focus on the oracles while the other players focus on clearing a path through the robots to the gate. If one person dies or fails, it's usually game over for all six. Finally, a breakthrough! 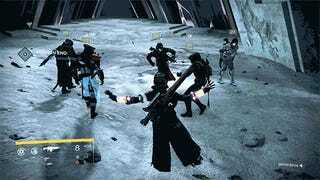 We determine that the three of us standing farthest away from Atheon are the ones who will be teleported. With this knowledge, we can assign three of us to act as a "home team" and the other three as an "away team," and have set roles for each team. We quickly fall into our roles and become much more consistent at fighting our way back through the gates and, with the aid of the shield relic, finally begin doing some real damage to Atheon. From there, it's only a matter of time and technique-tweaking until we win. There are moments when it feels like we just won't be able to do it, instances where we make a dozen perfect runs through the portals only to have a tiny error wipe the team out. Eventually (and, okay, with the help of a final strategy we found online) we figure out how to coordinate our attacks in order to do maximum damage while staying alive. We finally defeat Atheon. Our team celebrates, unified in our victory. It took us many hours—so many hours—to get here, but we did it. And despite all the other things we could've spent that time doing, our victory is rewarding precisely because it took so much teamwork. This wasn't a matter of leveling up our weapons so that they do more damage, or increasing our armor rating so that our characters were tougher. This victory was about knowledge and strategy, about working together and carefully learning a problem and in the process, understanding how to solve it. 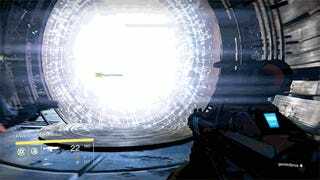 Playing through the Vault of Glass, it's hard not to picture an alternate-dimension version of Destiny where the rest of the game is just as interesting. Unfortunately, we do not live in that dimension, and for all its appeal, the majority of Destiny is an Edge of Tomorrow-like exercise in grindy repetition. When I asked Smith why that was the case, he said that due to the raid's constrained structure, his team was able to make the game demand much more players. "Look at the raid versus the structure of the rest of the game," he said. "The raids are linear in a way that a given suite of missions [isn't]. From encounter to encounter, in the raid, we're able to build your knowledge base and teach you more in a very predictable way. And I feel like sometimes we can't assure [that] organically in sort of a more linear campaign. We had this really good advantage of freedom, flexibility, and the knowledge of how you're going to be able to constrain players." "I think it's something that we're definitely looking at across the entire breadth of the game going forward." I asked Smith if Bungie is considering spinning the kinds of challenges in the raid out to the rest of the game in future expansions. "I think that in a bunch of ways, the raid team is doing a lot of forward-looking development," he said. "I think that we were given the freedom to explore, and that freedom manifested in a bunch of ways, whether it was the resources or time to test out different types of objectives and different types of experiences. Some of what you're really describing when you talk about the thirteen or the fourteen bespoke mechanics come very simply down to different ways to fail. And that's the thing that we were able to breathe into the action game in raids, and I think it's something that we're definitely looking at across the entire breadth of the game going forward." A bit later, he elaborated: "I think that people are craving different types of experiences. Giving people an opportunity to have different types of experiences in Destiny, of which I would say raiding encapsulates a number of different types of experiences, that's an opportunity for us to grow moving forward." Sounds good to me. Wouldn't it be cool if one of the bosses in a Destiny strike required the use of a relic shield, or if an area in a mission contained deadly gorgons that kill you on sight? 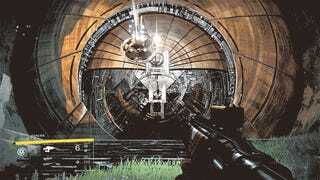 Any single section of the Vault of Glass could be spun out into its own mission or boss battle. Here's hoping Bungie follows through, and explores some new ideas, as well. Every time our team would get to a chest, we'd all wait until everyone was present before opening it. As it turns out, that wasn't necessary—every player will get loot from a chest even if they arrive way after it was opened—but even after we learned that was the case, we kept doing it. It feels good to stand together and celebrate our small victories, and I sense we're not the only raid team with that tradition. Smith confirmed that the chests don't require the team to stand together to open them, but said that he likes to see teams engage in that sort of behavior. "That anxiety that you're describing," he said, "like, 'No no, let's open it all together!' That's this awesome way that just feeds into yet another moment that you got to have with your team." Those sorts of moments have certainly brought our team closer together. I played along with a few other journalists—my Kotaku colleague Jason Schreier, Lifehacker's Patrick Allan, Patrick's friend Kevin, freelancer and sometime Kotaku weekend sub Mike Rougeau, and Digital Trends' Adam Rosenberg. Going in, I knew some of those guys better than others. Some, I've never met in real life. But after spending several nights banging our heads up against the Vault's toughest challenges, I would follow each of them into virtual battle any day of the week. "One of the things that we've talked about a lot [at Bungie] is that one of the things that binds you together in that activity is the collective failure of your effort," Smith said, laughing. "Your effort, forcing you to try again and again, update your strategy. It's building camaraderie. "I've talked a lot about how the raid is a lot like a ropes course," he said. "It's us teaching you how to be a group. If you look at how the activity is building groups and pulling people together, we hope that people play the raid together and end up meeting someone new and having a new friend, someone new to play with." As much as Smith's talk of team-building and friendship sounds like touchy-feely PR-speak, it's also accurate to my experience of the raid. The Vault of Glass has been the sort of challenging, rewarding team-challenge that the rest of Destiny promised, but generally didn't quite manage to be. It has brought me closer together with people I barely knew, and has given me a feeling of collective accomplishment that I haven't gotten from a video game in ages. We came, we saw, we blew up the giant robot. More please, Destiny.